(Keywords: Portable printer, mobile printer lithium battery)With social’s development, mobile and portable office have become a trend, portable mobile printer market has been expanding, most of them have been used for contracts, agreements, small amount of data to print users . Portable mobile printer is generally used for carrying use, with small size, light weight ,can be driven by lithium battery ,easy to carry features and so on, the design is mainly to meet the needs for moving use. When the printer working , the max current can reach 5A, normally working current is 0.5-2A,which has a high standard of battery’s stability and continuous working time, In order to reach the high quality standard ,we imported Sanyo batteries, it has the advantages of high energy rate , light weight, small size, high cycle life, high safety, high voltage consistency and so on .It is designed with output over-current protection value of 8 ~ 16A, continuous operating current of 5.2A, 500mAh charge capacity for lithium battery pack which can fully meet the printer of electricity demand. Battery packs also have the function of sending temperature signal, ID signal, output short cut protection and reverse charge protection to hosts . PCM: Mainly to protect electronic line of rechargeable battery pack (generally refers to the lithium battery) , due to the chemical characteristics of lithium batteries, it needs to provide overcharge, over discharge, short circuit, overcurrent and over temperature protection to avoid the risk of combustion, explosion and so on. Protection IC: The main chop is designed to online monitor the battery charge, over discharge, over current, short-circuit current functions, In order to keep the battery cell working under stable and high efficiency range. PTC: Mainly for secondary protection functions design. PTC can recover fuse with over-current protection, automatic recovery of dual functions. With PTC, the battery products can prevent high-temperature battery discharge and unsafe high current. 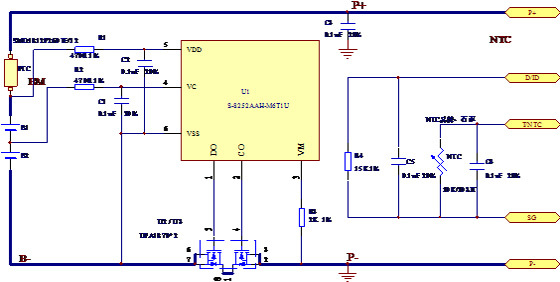 MOSFET: The MOSFET plays switch role in protection circuit, which could ensure the both ends load not to go up and go down forever and keep voltage stabilization. NTC: It can detect the core ambient temperature at any time, then send the temperature to host, the host can control the work of the battery pack by identifying the temperature signal.